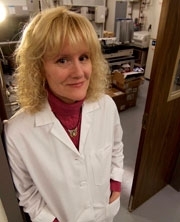 The Ambrose laboratory’s research program focuses on CBRNE (chemical, biological, radiological, nuclear and high explosive) agent mitigation, particularly Bacillus anthracis (the causative agent of anthrax), the ricin toxin, and organophosphate nerve gases such as sarin, soman, and VX. Our goals include the design and optimization of small-molecule anthrax toxin lethal factor (LF) inhibitors, and ricin toxin A (RTA) inhibitors, to be used as emergency therapeutics in the event of bioterror attacks, and engineering enzyme active sites to rapidly and effectively hydrolyze fast-acting nerve agents. We are a full-spectrum early- to mid-stage drug discovery laboratory encompassing high-throughput and fragment screening, lead optimization, structure-based design, cell-based assays, and modeling. We have particular expertise in Biosafety Level (BSL)-2 and -3 and Select Agent safety and security protocols. Professor Ambrose also has research and teaching interests in CNS-targeted drug design and optimization, focusing on psychiatric pharmacy and neuropharmacology.